New board, and as such, rebooting this thread once again. Thought I'd posted the cue list, I guess not? Let's try this again I suppose. [?] - Unknown track - Please help me find! All incidental music is S1ET. * - A shorter version of this track is known as "Meet the Family". Episode plot, art, dialogue taken from Rocket Robin Hood "From Menace to Menace". * - Organ music also used in _Dark Shadows_ series? fallen from Great Idol) - the same number that Capt. Kirk suffered in "The Omega Glory". This episode features longer, action based tracks, used heavily in later episodes (esp. "Blotto"). * - Used in "To Cage a Spider"
dog-like head and insectoid red eyes. * They should have used P. Gerard's "Crime Car" here. Mayor and General: No background music. Spider-Man and mayor 2: No background music. Spidey makes a cheap shot: No background music. Koga on TV: No background music. Micro Rolla-Bowl Ball: No background music. Jameson 2: No backround music. Jameson 3: No background music. "That was some fall. ": No background music. Thank you for posting the Spidy cue list as well as the composer /track list. Great, detailed list. Thanks for posting it. If only someone knew where to find those "?" / /Marvel Superheroes cues. MSH pooled music from various sources such as Conroy BM, Impress, Harmonic, Harrose (personal library of Harry Lubin), more than likely the elusive Video Moods, and maybe other unknown sources. The only MSH tracks that really were imported to Spider-Man from around Cloud City of Gold onward were a few Conroy BM Paul Gerard cues (Cosmos, Dissolve to Black, Spin, and Truck In, as well as a few unknown ones that are clearly Gerard's [named on music list as "Vargas' volcano," "Zap reveals Skyboy," "Lightning Mountain," and "Destruction of Gorth. 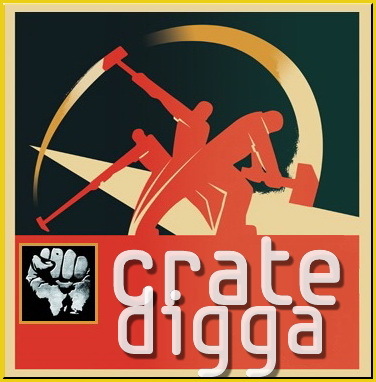 "]), and a few potentially imported from the Video Moods library ("Diving at prey," "Volcanic eruption," "Destruction," "Fallen idol," "Proton danger," what is more than likely the VM cue Quicksand, and "Awakening/crooks."). The only reason these and other albums with other unknowns haven't turned up yet is because the albums we're searching for just seem to be hard to come by (or those who have them are unaware of our mission), the amount of album clues we have is rapidly shrinking (only albums we currently have ideas to look for are BM 350, 402, 415, and EA 1067 and 1068, the rest could be from quite literally anywhere [from where exactly did they yank the Criminals in the Clouds band march, the Phantom From the Depths of Time organ track, and the Neptune's Nose Cone drumming? ]), and to top it all off, the Video Moods library is next to impossible to find even one album for. You'd be lucky to find just one of those. ...and to top it all off, the Video Moods library is next to impossible to find even one album for. You'd be lucky to find just one of those. Completing--locating/obtaining the remaining Spider-Man cues seems like an impossible mission. By the way, if anyone is familiar with the 1967 Christopher Lee horror film Theatre of Death(originally released by London Independent Producers and later distributed on Anchor Bay DVD), the main title and end credits music is undeniably music used in MSH's Thor and Hulk episodes. The film credits Elisabeth Lutyens as the composer, and conducted by Philip Martell. If this is the case for every cue in the film, then it might be possible to search for this film's soundtrack (if it was ever released in the 60s, or later, through a Varese Sarabande or Film Score type of label), or search for any library albums her work might have been a part of. So, to give this thread a bit of much-needed life, I'm going to pose another theory. I had posted this back on the previous board, but since the place had fallen apart from the inside pretty much nobody saw it. So, my theory is this: The unknown cue in Home when Spider-Man steals the yellow device from Carol (listed as "proton danger") is possibly "Portents" by Ward Sills, released on the Video Moods library. My first reference point for this is the old SABAM cue sheets. (I still have access to them because I took screenshots of them.) On Home's list, among the small selection of named KPM Brownsleeves and 5-minute long cue "SPIDERMAN" attributed to Loose and Cadkin, on the list is Portents, clocking in at around one minute. Now while the list shows its runtime as being 1 minute long, the cut in the episode runs for about 7 seconds longer. One could say this disproves the theory, but bear in mind the SABAM database was full of all sorts of other absurdities, such as mislabeling Fire Burns as "Free Burns" (said listing was on Cold Storage's list), and mistook Hubert Daum's "Fight and Death" as Gerhard Daum's "Fighter," a Sonoton track from the 90's, so oddities and incorrect information is to be expected from the database. It also just feels rather fitting for the scene it's in, as the word portents, by definition, refers to signs or warnings that something catastrophic is about to happen-which is exactly what the Spider-people are going through during the scene. Finally, this mystery cue is yet another cue that was imported from The Marvel Superheroes. I recall it playing in the Captain America episode where Red Skull brainwashes Cap into serving him, though it may have played elsewhere. Additionally, the way the cue sounds overall sounds a bit similar to other potential VM Ward Sills cues, namely the strings. Anyway, that's just my little theory on a cue's potential identity, make of this post what you will. How can I find SABAM cue sheets? A search for "Wladimir Selinsky papers" at the Archives and Manuscripts section of the New York Public Library's web site yields some interesting material. From this, EA 1072 and 1071 are correct (with the exception of Anyone Can Win not being listed on 1071). I don't know about 1073 or 1074, but I do know that 1074's "Time Sequence" is wrong, as that was the suite on the earlier EA 1013. As for the numbered range, Moonless Night Cartoonorama (referred to as a track, actually another suite) belong to EA 1069. Thanks to the old eBay lot photos I saved, Pursuit, Propulsion, and Furious Encounter were on EA 1067's B side, and Chronometry and Portents (as well as the unlisted "Flurry") were on EA 1068's A side. As for Fate, Quicksand, The Long Walk, Velocity, Up and Down, Carefree, Rage, Eruption, Who's Got It?, A Cartoon Curtain, and Angry Statement, there is unfortunately no information as the which albums these tracks belong to. My guess would be that Quicksand, Velocity, and Fate might be on EA 1067 and/or 1068, if it is to be believed that these are more of the unknown MSH/Spider-Man cues. Hopefully more Video Moods information crops up soon. I don't know if it ties in with this thread, but I think that the Spidey's enthusiasts will be pleased (so don't blame me). 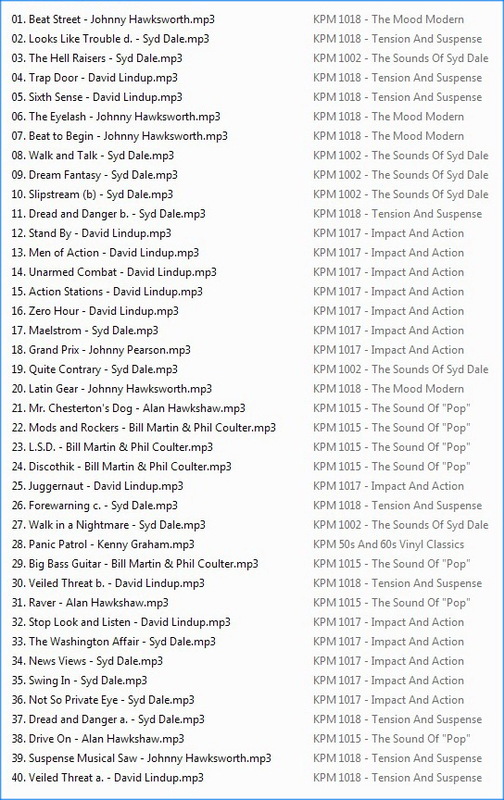 Here an home made tape revisited by a friend (Cobb, whom I thank very much), containing the vast majority of the KPM 1000 Series tracks used for the serie between 1967 and 1970 (saison 2 & 3). A nice work as valuable as the others made before, I think. And as an added bonus, the complete SpiderMan Animated Series, found on Youtube (many thanks and kudos to kidscartoonmania). Here is a list of Ward Sills cues for Video Moods. Please note that I don't have copies of any of these records. Very interesting. From where did this info come from? So, putting Caliban's album/runtime info in mind, I went back through some episodes with potential Video Moods cues in them, and this is the new set of theories I've pulled from it all. Thanks again to Caliban for providing this information. I'll try to get around to finding a way to add these potential identities to the list very soon. 6-16-18: Music list has been modified to include new potential Video Moods cue names after each respective cues' ? on the list. 7-10-18: Added info relating to what I theorize to be Fate and Rage.